After finding himself fed up with Facebook’s promoted posts and Tumblr’s full-page ads a few years ago, Paul Budnitz decided to make his own social network. He hired six people to build, Ello. To set Ello apart, he promised it would never have advertising. And he gave it a minimalistic design. In an era where web designers are making their sites more complicated with “Snowfall” like effects, Ello stands apart by looking like something that was created with a typewriter. For a year, it was a private network for Budnitz and his friends. At the start of this year, Ello raised $US435,000 in seed funding. In March, members were allowed to start inviting other people. In September, Ello went viral thanks to Facebook’s ham-fisted policy on names. Facebook alienated the LGBT community by forcing transgender people to use their original names instead of the name they chose when they changed gender. The LGBT community discovered Ello, which allowed them to use whatever name they wanted. Suddenly, Ello became a thing. Media outlets picked up on Ello. 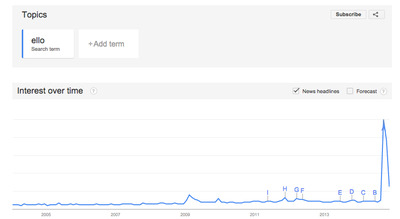 Curious, or bored with Facebook, people wanted to check out what the ad-free network was like. By October 1, 50,000 people were signing up to use Ello every hour. By the end of October, Ello had 1 million register users, and 3 million people on the wait list. 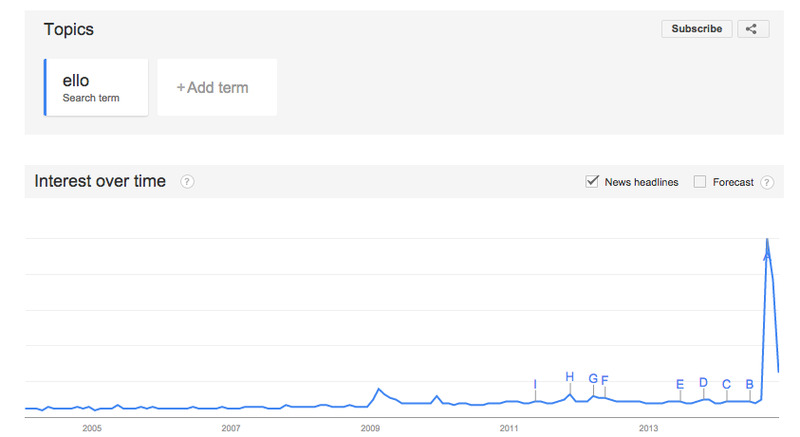 But, the buzz around Ello died as quickly as it grew, as you can see in this Google Trends chart. 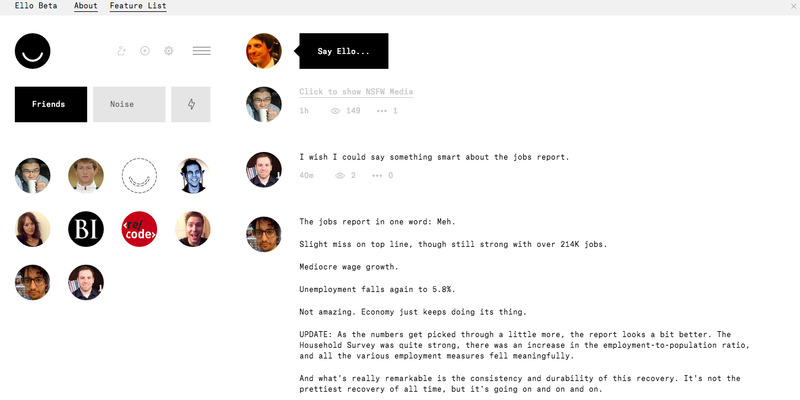 It looked like Ello had had its moment, and the world was ready to move on. Yet, at the end of October, as the hype was petering out, Ello raised $US5.5 million from investors, led by the Boulder, Colorado-based Foundry Group. How is Ello going to survive the rapid boom bust cycle it just went through? How is going to thrive in the long run despite the inherent challenges in getting people to use a new, desktop-only (for now) social network? After speaking with Budnitz and his investors, it seems like the answer to those questions is: just keep on keeping on. There is no master plan, Ello is just going to create a new social network that’s free of ads, and hope that people stick around. “We’re huge fans of Paul, and I think that our interest in Ello was probably mostly in Paul, and then obviously this feels like it has the potential to be something that’s really big, and our business is investing in big ideas,” said Seth Levine, a managing director at the Foundry Group, when we talked to him about the investment. While people may have their doubts about Ello, creating something that many say won’t work is nothing new for Budnitz. 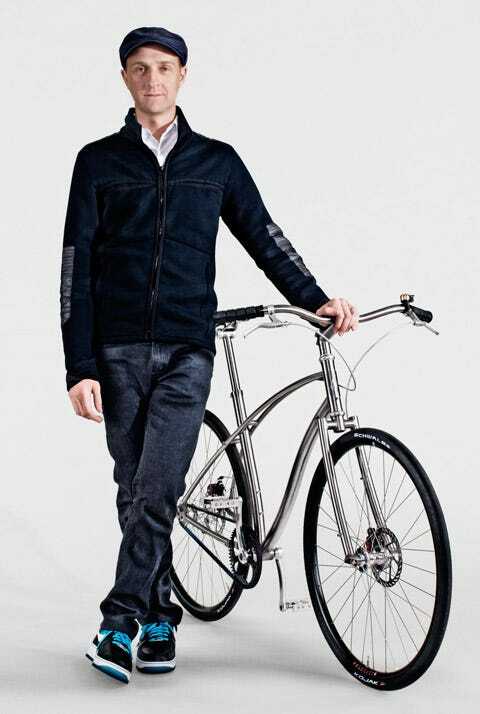 Budnitz is an author, award-winning filmmaker, and the founder of two successful businesses: Kidrobot, which creates and sells art toys that have been accepted into the Museum of Modern Art’s permanent collection, and Budnitz Bicycles, which sells high-end designer bikes for city riding. Budnitz says he almost considers his businesses as art projects when they begin; something exciting and slightly foreign in concept. Budnitz says it was difficult to secure funding originally for Kidrobot, a company he later sold after growing sales to more than $US15 million. The same held true for Budnitz Bicycles. “It’s a lifestyle choice, and this is something I’ve been living by for a while,” he said, mentioning that he considers Ello to be a lifestyle choice too. Budnitz insists that people seem to misunderstand the intention of Ello. He doesn’t need 1 billion users like Facebook for his company to succeed. He just wants to attract a few million people tired of the boring design and ad-infested layouts on other social services. Budnitz and the Ello team have guaranteed zero ads on Ello, not now, not ever, and he says it will all be possible due to Ello’s business model, which will allow users to pay a few dollars for new features they like. Levine, the Foundry investor, which led the $US5.5 million funding round for Ello, believes its anti-advertising manifesto will spur its success. 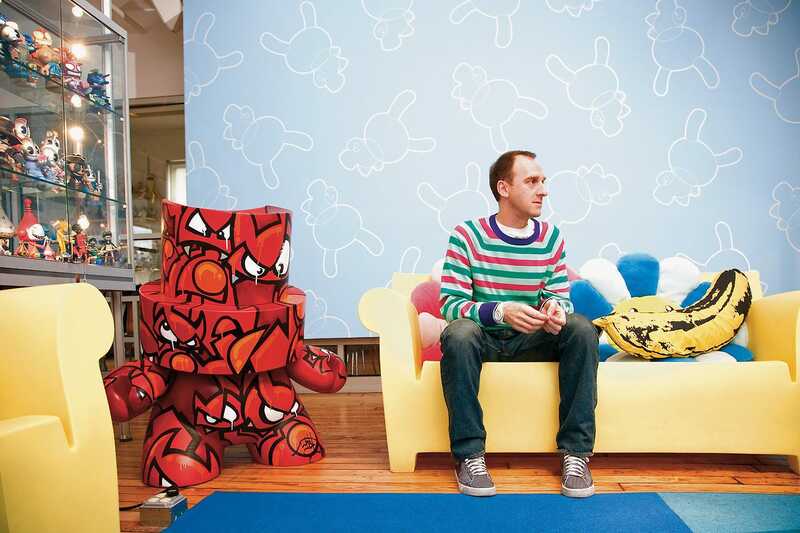 Historically, the odds are stacked against Ello, and the risk is very real. Ello is betting that people dislike advertisements on their social networks so much that they’d be willing to uproot from Facebook and others to move to Ello. This is a tough sell when you consider that Facebook has 1.3 billion users, despite the ads. In fact, every major form of media from social networks to newspapers to radio to TV is supported through advertising. People seem perfectly willing to tolerate advertising in exchange for content. The big question is: Do enough people dislike ads to the extent that they will switch? And if they do, will zero advertisements be enough of a killer feature to keep its users there for the long haul? As a Public Benefit Corporation, Ello is legally prevented from selling user-specific data to any third party or running any advertising on behalf of a third party, and if Ello is ever sold, the acquiring company is also required to maintain Ello’s status as a Public Benefit Corporation. In the longterm, Levine says turning Ello into a Public Benefit Corporation means that Ello won’t need to be focused on making money. Instead, the Ello team will use the $US5.5 million to build out Ello’s core feature set, move the social network out of beta and into the public, and eventually introduce the optional paid features. Ello’s next step is to build and refine the social network’s core features, and focus on supporting its growth, which Budnitz says is exceeding expectations. From an investment standpoint, Levine says Budnitz and the Ello team now have the resources to run Ello for the longterm, and that there’s no rush to turn profit. Much of that runway will be used to flesh out Ello’s overall design and features, which will be essential to turn the casual Ello user into someone who visits the social network daily. While some designers and artists aren’t keen on Ello’s minimalistic design, Budnitz says the social network will balance the act of showing people what good design looks like and allowing them to customise Ello to how they’d like it to be. ello.co/lucianHere’s the Ello profile for Ello designer Lucian Fohr. But some things, like Ello’s use of the Atlas font, will be allowed to be tweaked. At the end of the day, Budnitz says he’s just excited to bring another project that he finds beautiful to fruition. With financing figured out, it’s time to see if Budnitz can fight against the current one last time to turn an artist’s experiment into a thriving social network that lasts longer than a season.